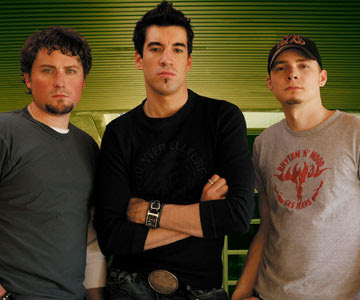 Theory Of A Deadman is a Canadian rock band from Delta, British Columbia, formed in 2001. The band is currently signed to Roadrunner Records as well as Island Records. The band also includes traits of other music styles, such as country and acoustic, as well as their post-grunge and alternative rock base. So far, they have a total of 5 top 10 hits on the Hot Mainstream Rock Tracks chart, including one #1 hit, "Bad Girlfriend"...On May 25, 2011, it was announced that Theory of a Deadman will co-headline the Carnival of Madness Tour with Alter Bridge. Supporting bands include Black Stone Cherry, Adelitas Way, and Emphatic. The band contributed a new song, which was co-written with The Exies singer Scott Stevens, called "Head Above Water" to the Transformers: Dark of the Moon soundtrack, which is to be released on June 14, 2011. Another track titled "Drag Me to Hell" was made available through the official Roadrunner Records website on June 16, 2011 , for free download. The second official single, "Out Of My Head", was released on June 14, 2011 (Wikipedia).